8th in the WORLD! 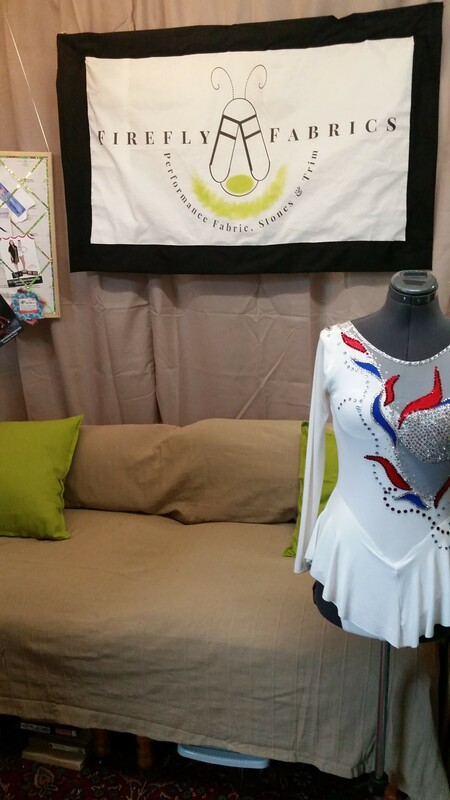 Awesome finish for her first World Championships appearance. Love this shot. Really great loop for her, too! Anyway, we’re home from two weeks in Italy and Paris (ok, 9 days in Italy for the World Championships, 5 days in Paris for…well, for me, really. We sent her home with grandma so my husband and I could go fabric shopping in Paris alone…uh, I mean, go sightseeing in Paris alone…), and the shop is undergoing HUGE changes! 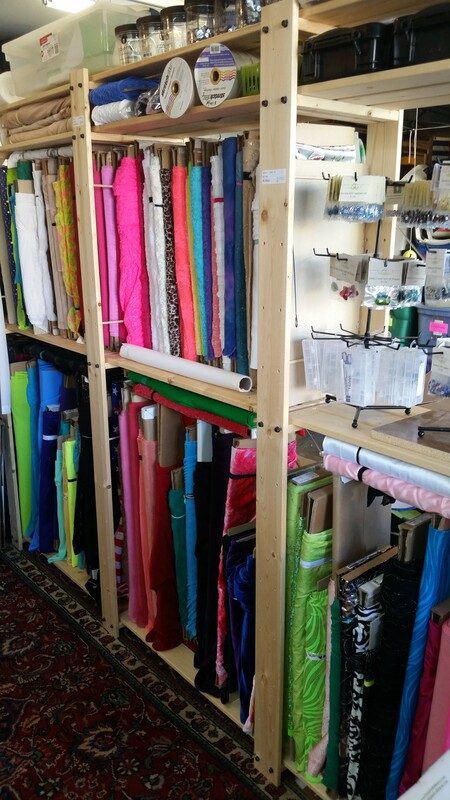 I have new fabric stocked (ombre lycra and mesh in lots of colors! 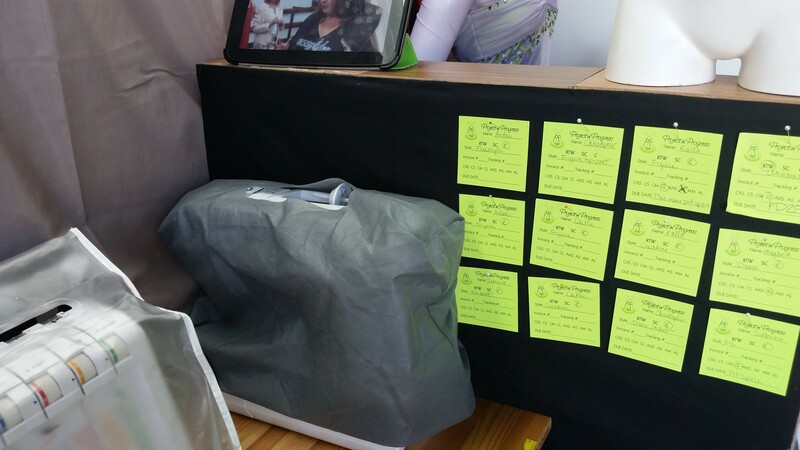 ), and we’re working on moving the entire thing into a mobile pop-up shop by the spring! 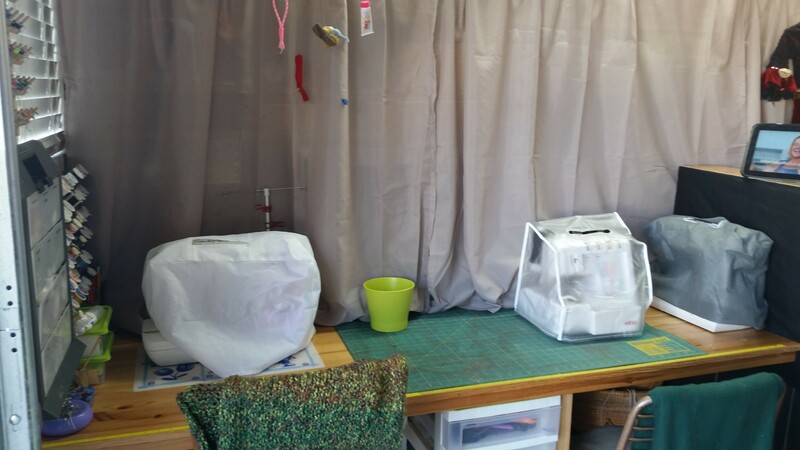 This will allow me to travel to many, many more competitions and venues throughout the year, and best of all…I can turn this great shop/sewing/storage space into a dedicated design studio, with a changing room, mannequin display, work stations, everything! As a result, the place is a complete pig sty, which thrills me to no end, of course. So because there wasn’t enough chaos in our lives, I decided to take on another task as a pattern tester again for 5 out of 4 Patterns. This time we tested the new Ninja Leggings, and they are amazing! The pattern has been released at NO COST if you join the 5 out of 4 Facebook group. It’s a downloadable PDF pattern, very well written, with excellent, clear instructions for all sewing ability levels. 5 out of 4 Patterns NINJA leggings. So comfortable! Go get this pattern NOW. Best of all, there is NO ELASTIC necessary in the waistband. There are four different waistband versions (low rise, mid rise, high rise, and extra low-maternity rise), and virtually unlimited length options (shorts, capris, long, extra long, or anything in-between). Emma is wearing the low rise, extra long version above. So because my shop is a terror pit right now, and because there is a mountain of scraps honestly four feet high out there, I decided to whip up a few more pairs of these Ninjas. Each pair takes only one yard and about thirty minutes start to finish. They’re going to be perfect for chilly rink mornings this winter! Scary season is upon me, which isn’t exactly as it sounds…it’s not scary because of the workload; it’s scary because the workload means my shop has become an utter hellhole. There are scraps everywhere. EVERYWHERE. 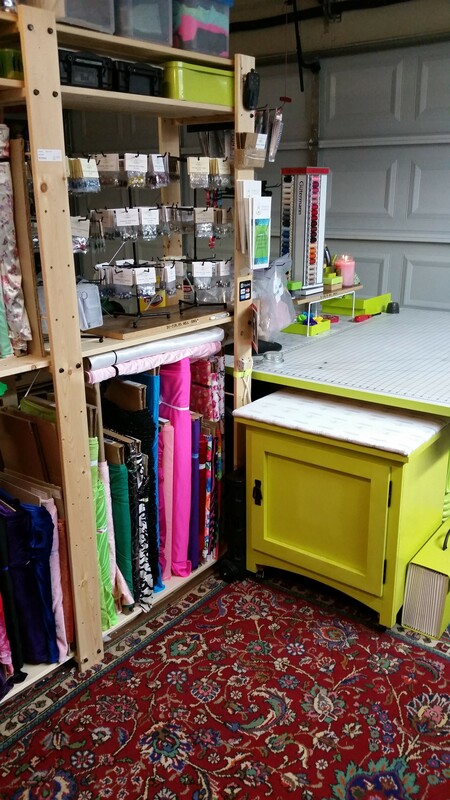 I even devised a new scrap storage system, but it doesn’t matter — just when I get them under control, I find I need 1/8 yard of this or that, and everything ends up on the floor of the studio once again. Just when I find enough horizontal space on my gigantic work table to cut out pieces, it quickly becomes engulfed in yards and yards of swatches, bolt ends, and yes, more scraps. Piles of scraps behind my machines = I can’t push them back to use the table space in front of them; piles of scraps around my chair = I have to climb over the back just to sit in it; piles of scraps around my thread spools = every few hours my cones stop feeding and I have to perform a sort of archaeological dig just to find them again. 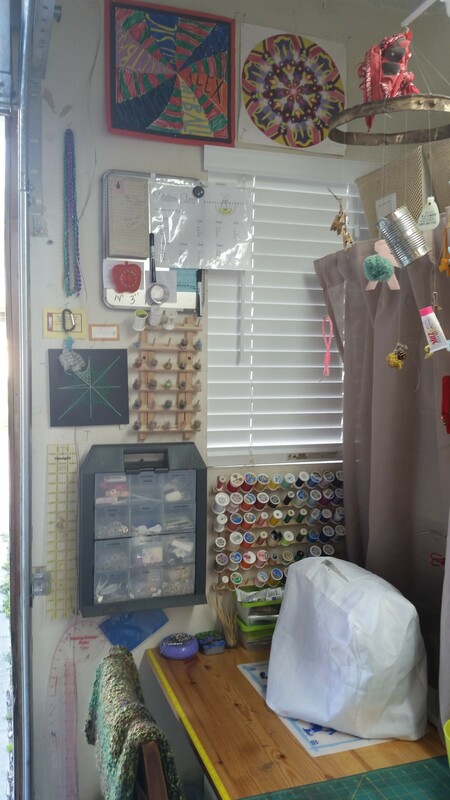 I clean up my scraps every night, believe it or not; but right now the volume of merchandise coming out of this studio is at a point where the scrap count reaches critical mass about two hours after the start of each work day. 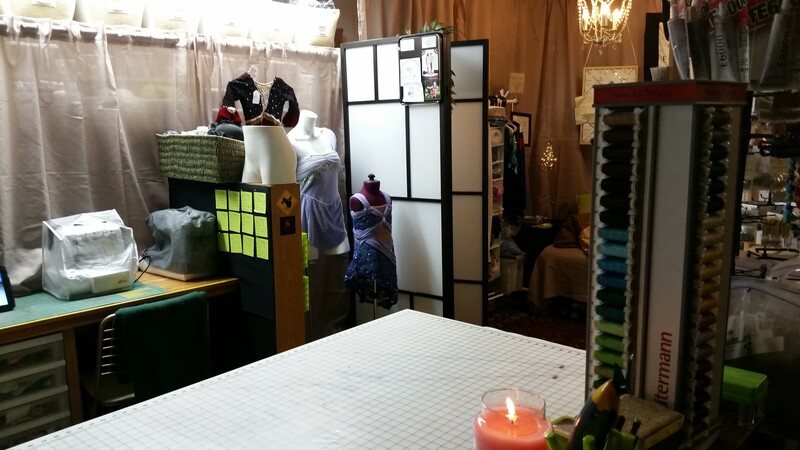 The chaos makes it difficult to work, though oddly enough, it makes me work faster because I’m not in the calm, relaxed, lovely little space that is my studio when it’s clean. No, the workshop is a hazardous place to be during the month of May, so the faster I can get my work done and escape, the more likely it is I’ll be able to find my way out anyway. So I let it continue. I didn’t come up here to write about my mess; I actually came up here to look for a chalk marker that is, no doubt, buried in a corner under a pile of scraps. But while I’m here, I’ll share a photo of a simpler, less-scrappy time, when these girls were tiny. Here they are, holding their first club dresses, circa 2003. Allison already has the best club dress of all — a Team USA dress — from her 2015 World Championships trip. Hopefully Emma will earn that dress this summer. Well, it’s been 18 months, but I think I’m finally finished! We started this garage “renovation lite” project in September 2013. I say “renovation lite” because it didn’t involve any destroying of walls, demolition of floors, or anything very exciting or fun. It did involve several trips to Ikea, a lot of curse words (because on the little ladder I’m still about 2″ too short to attach anything to the ceiling, which means getting out the big ladder, which means way more trouble than just waiting until someone taller comes home), and many, many exclamations of, “There’s so much room for activities!” by the kids. Over, and over, and over again. If you’re unfamiliar with this quote, at the risk of revealing how not evolved we are in this family by sharing what we find funny, check out the video below (or go to https://www.youtube.com/watch?v=ulwUkaKjgY0). There is one curse word in it, so skip the first 30 seconds if you’re near someone who wilts at the sound of one of the most perfectly dropped F-bombs in cinematic history (OK not really, but it’s still pretty awesome). Anyway, so with all my newly acquired room for activities came newly acquired space for the kids’ crap. I managed to keep the space pretty nice until Christmas, when it was a magnet for kid #1’s excess college junk when he came home for a couple weeks. Then it became the landing spot for so much camp stuff (so, so, so much camp stuff). Then when it was clean again, kid #1 came home for the summer. Kid #3 waited about ten minutes after kid #2 left for college to move into his bedroom, vacating his completely. Then we waited about ten minutes to turn kid #3’s bedroom into an office. This meant that when kid #1 returned home for the summer, we no longer had space for his paraphernalia. We were careful to be sure that we still maintained enough beds for all four kids (there’s a sofabed in the office), but we neglected to reserve space for their entourage of boxes, books, and the mounds of laundry they brought home and continued to create throughout the summer. 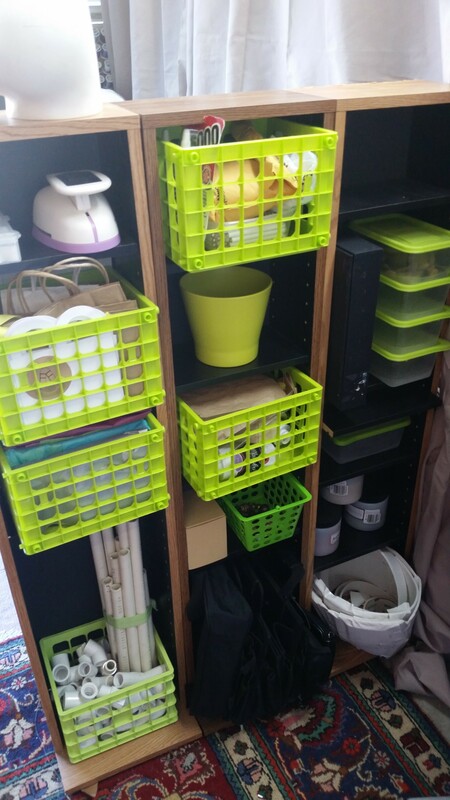 Thus, my newly acquired activity space became the repository for anything and everything that required even one tiny shred of brain energy to find an appropriate spot for in the house. I had to do something. I’d lost my beautiful work space to piles of camp files, stuffed animals, boy laundry, duffel bags and first-apartment-Ikea-accoutrements. 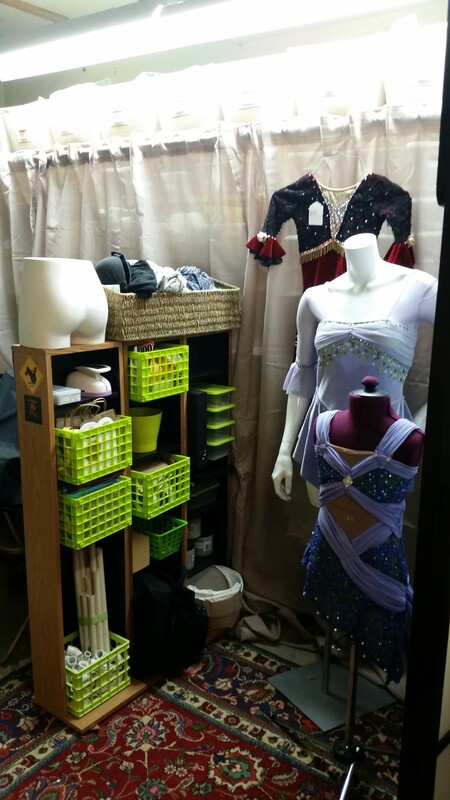 To make things worse, I couldn’t put away stuff that actually did belong in the shop, so bags of scraps, leotards, fitting supplies, and general sewing junk were now stacked atop kid #1’s piles. When I had to cut out a few dresses on the dining room table, I knew things had gotten completely out of hand. Camp ended, kids #1 and #2 left for college, a gigantic Christmas party came and went, and still I lacked all motivation to dig into the piles that had taken over the workspace. The thing that should have pushed me over the edge was a huge project in February for the Claremont Colleges Dance Team, that ended up leaving what felt like millions of green sequins everywhere. EVERYWHERE. I’m still finding the tiny, doughnut-shaped metal pieces all over the place. The dog even had one on her foot the other day. I knew I needed to get rid of the sequins once and for all, so I started what felt like an archaeological dig to clean up the place. Northwest wall, where kid #4 pretends to do homework but I think she’s really just watching 50 First Dates. View of the northwest wall. Second best part is the crystal chandelier; best part is that my husband didn’t think I was nuts for wanting the chandelier in the first place. 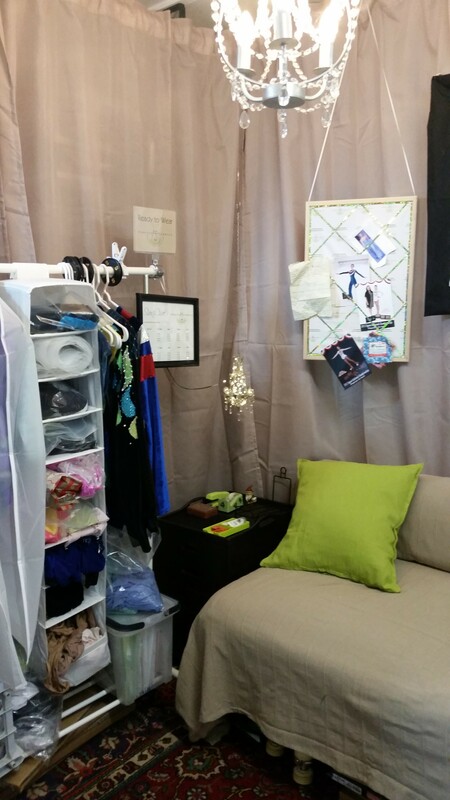 The screen opens up to create a private changing area for fittings. West corner. Crystal chandelier #2. Office supplies, tax info, everything boring is held inside the black file box. 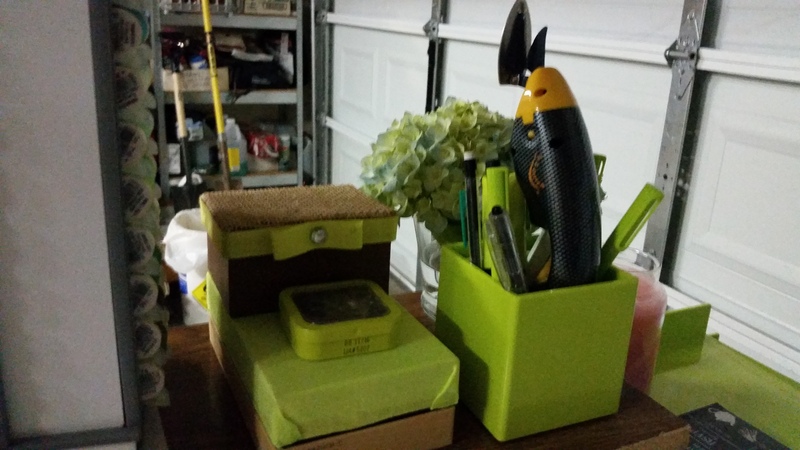 I don’t know why it looks so small, but it’s two file drawers deep! Works in progress. 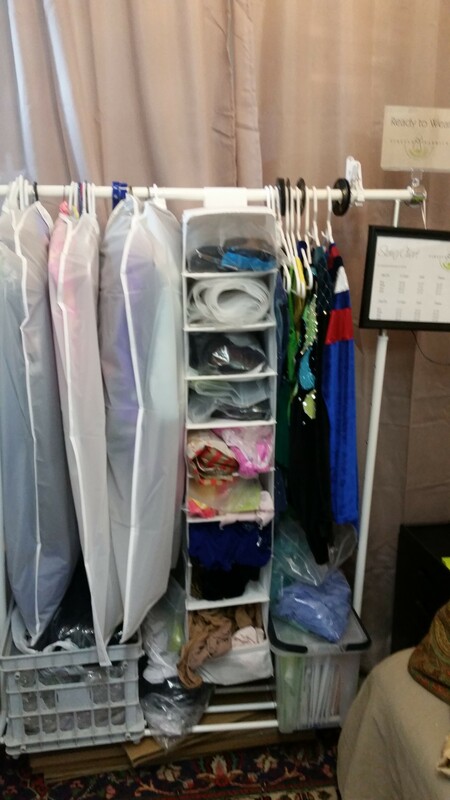 For some reason this also looks really small, but each garment bag holds TEN dresses for sale, packaged up for travel. 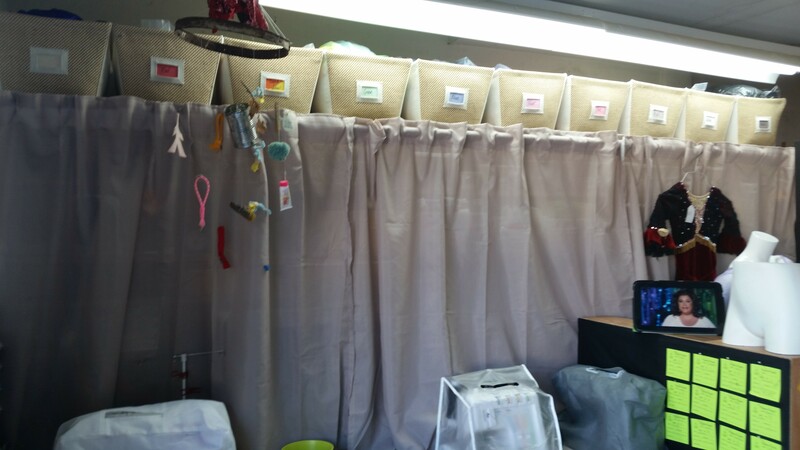 Each compartment in the hanging shelves holds an outfit in progress. Moving around the room, the southwest side. A couple more mannequins, actually dressed for a change. 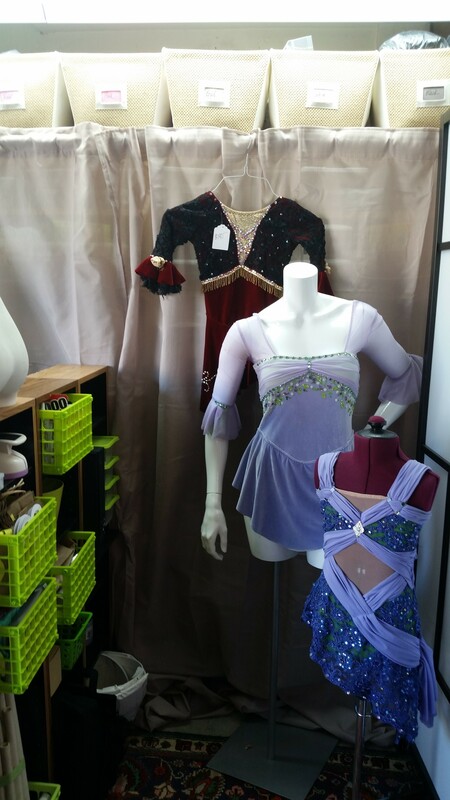 Mannequins and dresses for sale. The kids have named all the mannequins in the shop…here we have Marie Antoinette and Peg (named for the pole inserted into her derriere). 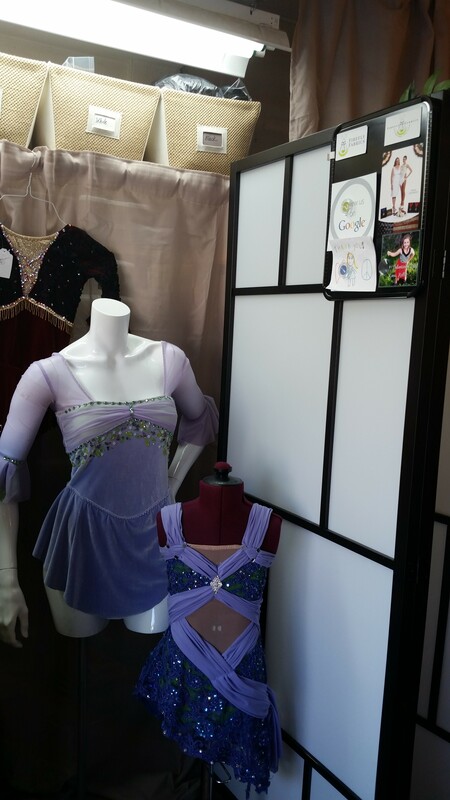 And here we have Buttsy on the left, used for pinning skirts to children’s skating outfits. Also all the random junk that doesn’t really go anywhere else. 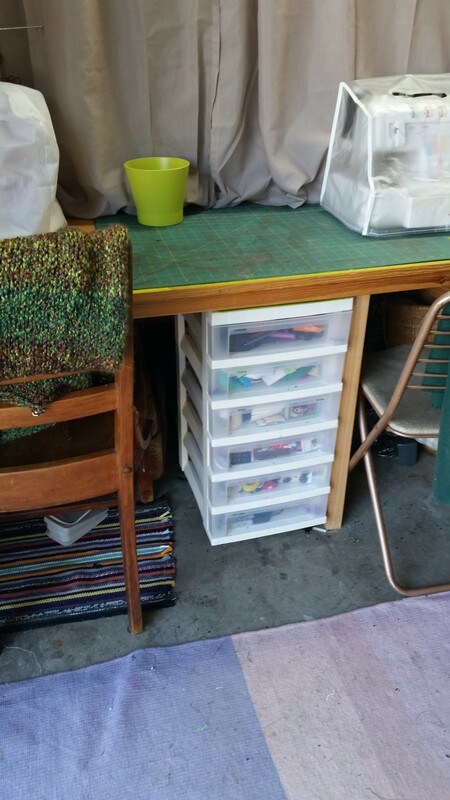 Closeup of my random shop stuff…bottom left is adjustable stoning frames out of PVC, shop packaging, and lots of fabric dyes. Check out the previous post describing my stoning frames. 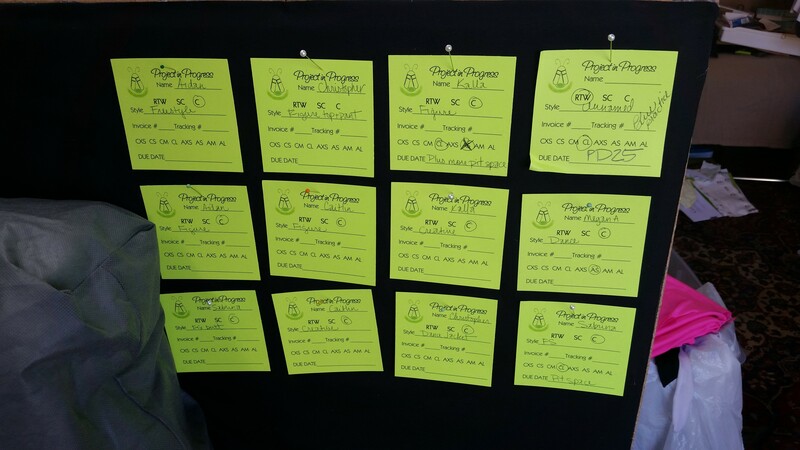 Close up of tracking cards. After garments are cut, the tracking cards go into these awesome clear card holders, leftovers from my days as a second grade teacher. The bags are from the dollar store. 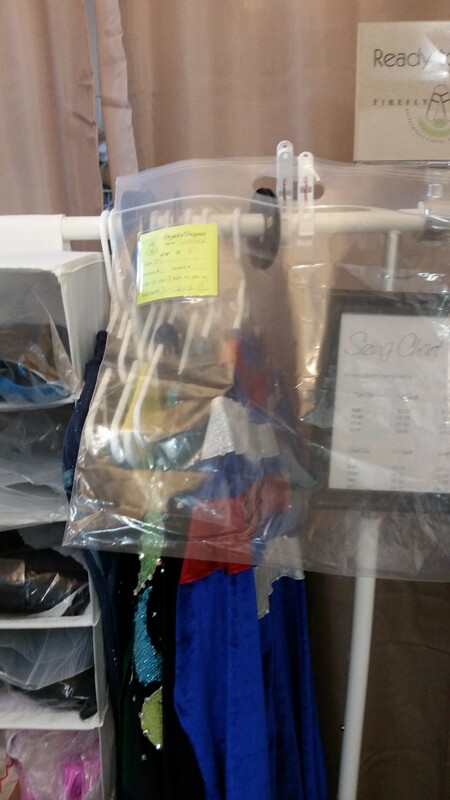 Each bag holds everything I need for each garment until it’s completely finished — then the info off the card makes compliance and tracking a piece of cake. Above the tracking cards — scraps, all scraps, all lycra. 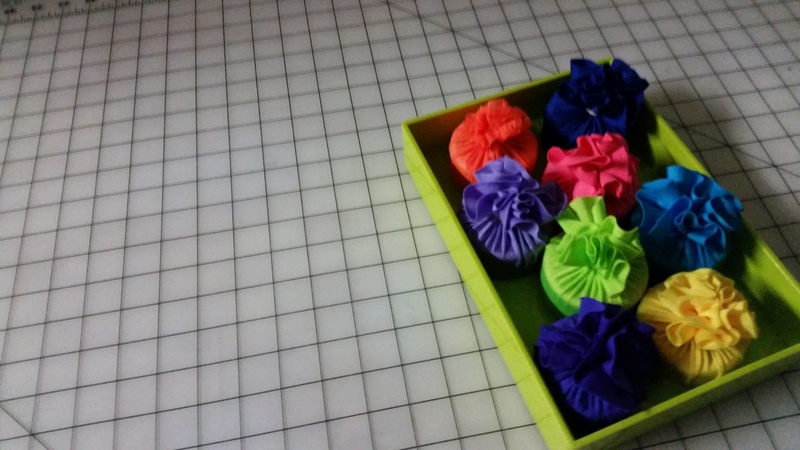 Each basket holds about ten yards, divided by color. Pieces are all 1 yard or less, usually much less…but sometimes we just need a tiny bit, so anything bigger than 12×12 gets saved. I probably have 40 shades of blue alone. 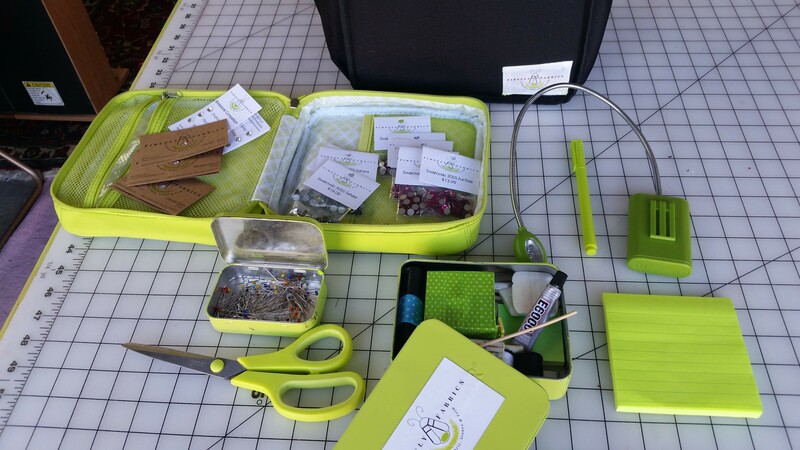 Closeup of one of the scrap boxes. These are about 15″ x 24″…found them at Home Depot a decade ago and they’ve held up great! Bags are the XXL size garment bags from the dollar store. Except for the top drawer (which is all scissors), each drawer holds elastic. All elastic…every kind of elastic imaginable! Miscellaneous Stuff Wall. Includes ancient elementary school art by the boys, and a mobile made for me out of special camp items, circa 2000. My awesome husband added casters to the bottom (because I thought it would be easy for me to do by myself, which it wasn’t) so it rolls in and out! 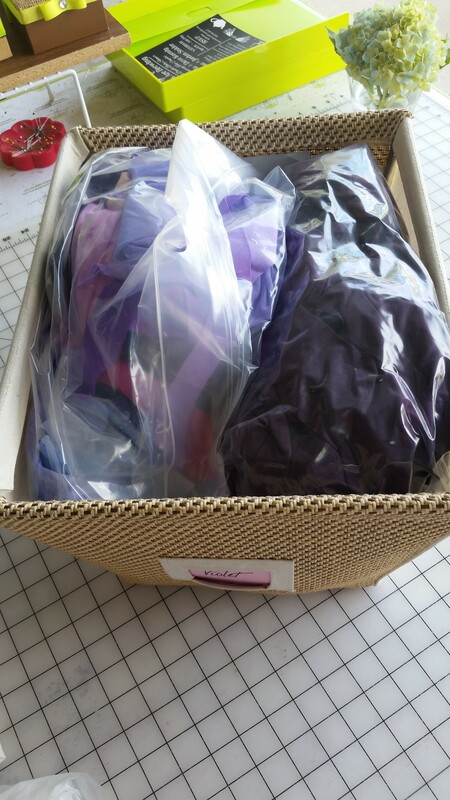 Inside the cabinet is a HUGE vat for dying fabric — so glad I found a place to stash the thing. 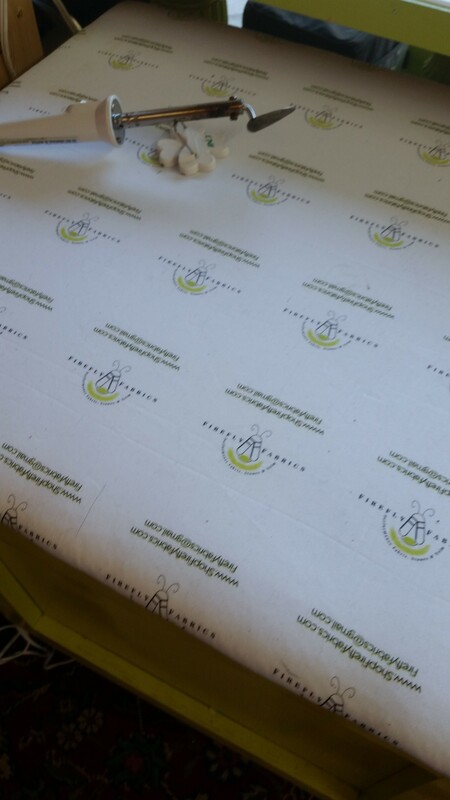 Close up of my stupid Spoonflower mistake, turned into an ironing surface. Pattern weights (aka old roller skating wheels, filled with fishing weights). Check out my previous post on how to make these weights. Top of the cutting table. The kids named the electric scissors “Jaws” and in one of the boxes is my electric seam ripper, “Jack.” As in Jack the Ripper. I promise my kids aren’t seriously demented. One of the boxes contains my frequent buyer and rewards program cards. 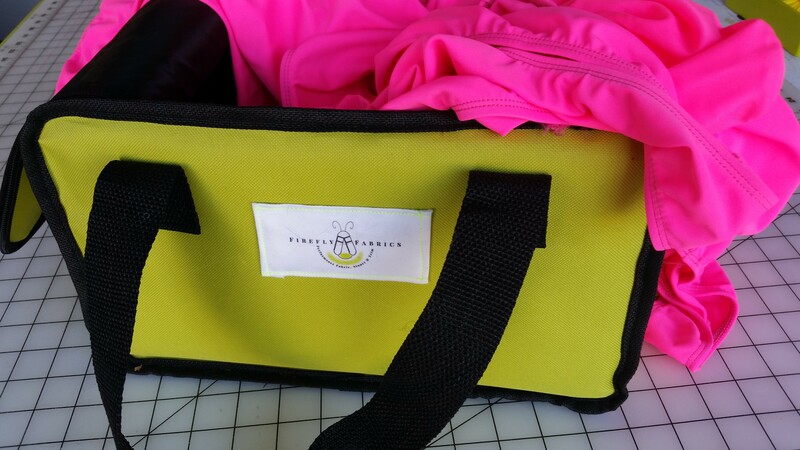 Under the cutting table — my travel fitting bag and my sizing leotards bag. 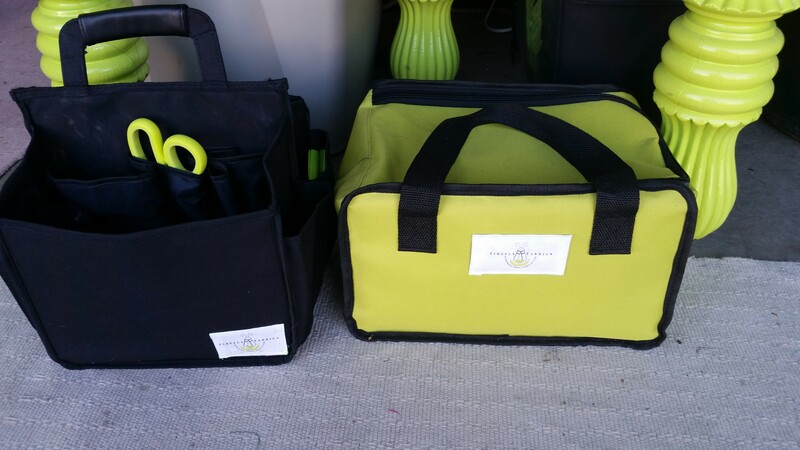 Inside the travel fitting bag. Future post will explain this awesome little thing, contained in a throw-away bag I picked up at Ulta for pennies! I bought three of them for $9.99 total, added my logo tag, and I probably get more people wanting to know who manufactured these for me than anything else. View of the east corner. 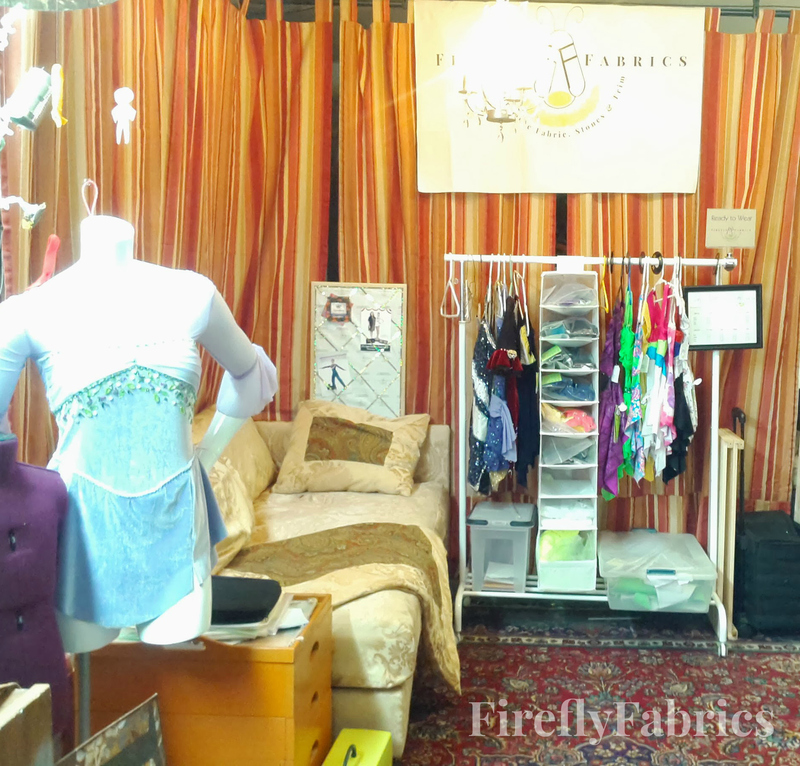 Lots of rhinestones on racks, and a partial view of the dining room table – turned – cutting table. 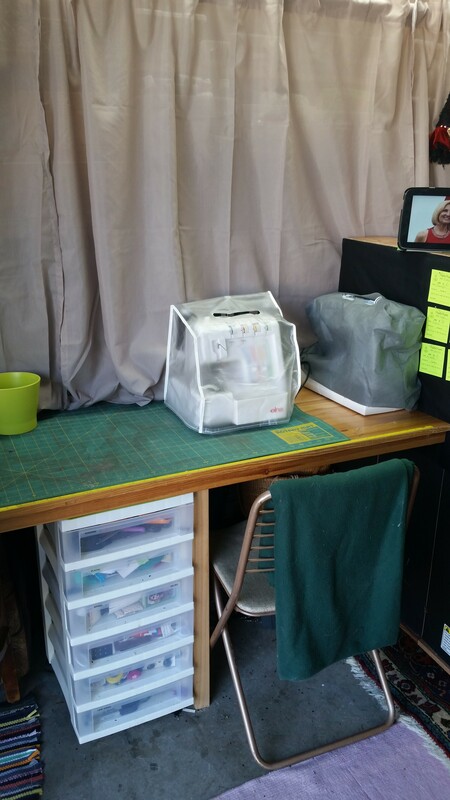 I didn’t get a good picture of it, but it holds a giant white cutting mat on one side, and various cutting table supplies on the other. 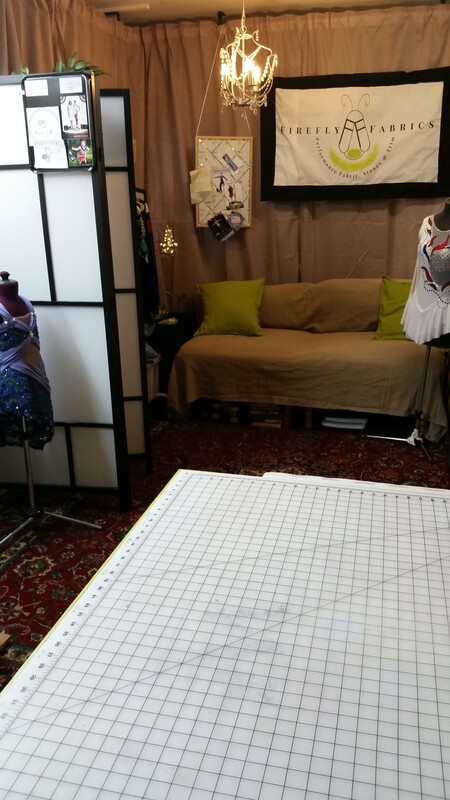 There’s a better photo of the cutting table in a previous post. Fabric row, courtesy of Ikea shelving. 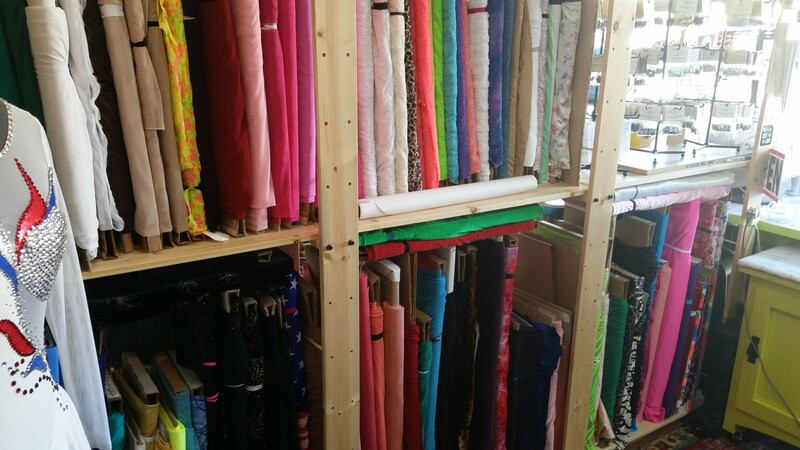 Another view of one row of fabric. These are the fabrics I won’t be using this season. This beauty is the creation of my husband. 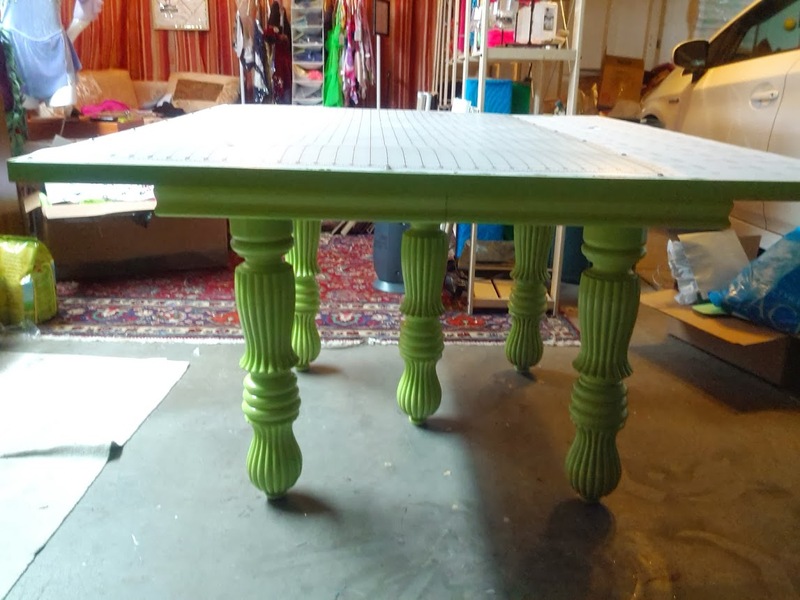 It’s huge — 4 feet by 5 feet — but its utility is far outweighed by the sheer awesomeness of the chartreuse green paint we picked out. What started as an old hand-me-down table, missing its leaf, and obviously a mistake of short-lived 1970’s trendy interior design, is now a cutting table and ironing surface. 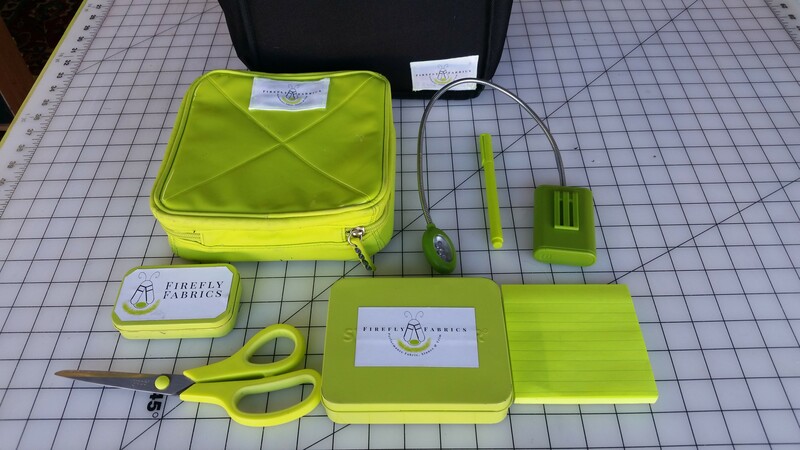 Inside a matching chartreuse metal tin is my too-hot applique iron, my too-convenient portable heat shield pad, and my too-fun pair of electric scissors. 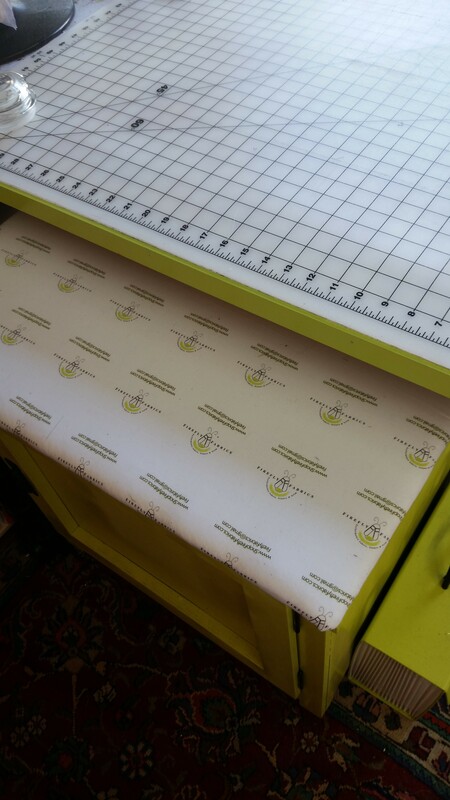 The self-healing cutting surface is not quite 4 feet wide, so the remaining tabletop is covered with another mistake — this time mine — a 12″x60″ piece of fabric printed by Spoonflower with my shop logo and website address, which was supposed to be used to make garment tags, but the logos ended up being much, much too large. 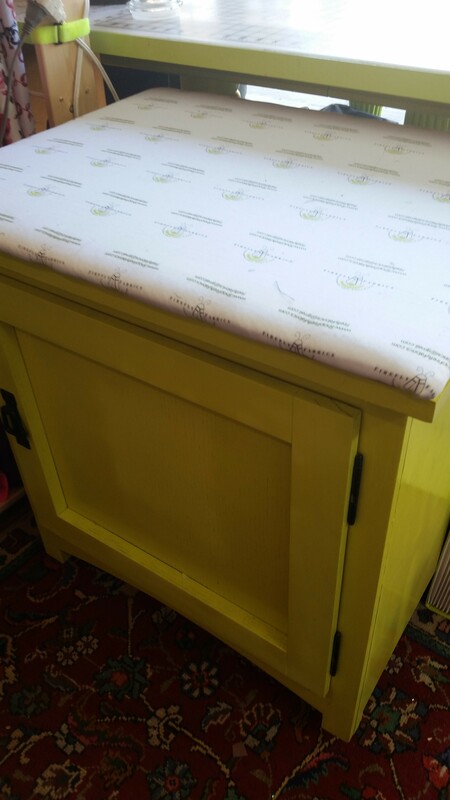 In his usual way, he finished it with matching chartreuse molding (see? I’m not the only perfectionist in the house). It looks much better than it ever did as a dining room table, a true achievement for any upcycle project. Why chartreuse, when I could have chosen from thousands of colors (see my post on color obsession here)? Because in my former life I worked for a huge advertising firm, where I learned quite a bit about branding (between laying off people in waves…1992 in an advertising HR department was one of the worst places to be); so all our marketing/business materials and nearly everything in the shop is natural wood/burlap, shiny metallic black and chartreuse, and what doesn’t already fit into this little box will — as soon as I can afford to convert it. 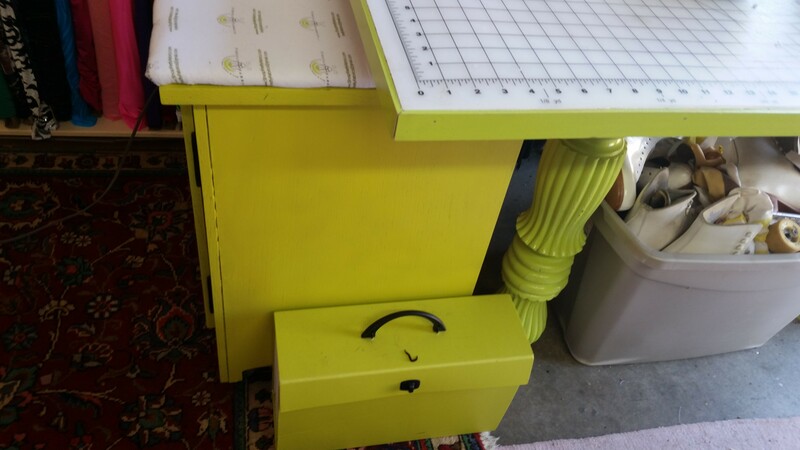 But in the meantime, my chunky chartreuse cutting table will keep me happy for a very, very long time.